From the kitchen of One Perfect Bite...This recipe is one that everyone claims to be their own. It's often called shiny topped cobbler and I first found it called by that name in The Pittsburgh Post Gazette. It then moved uptown for an appearance in Wine Country Living where it had become Mixed Berry Cobbler, a dessert considered to be worthy of ending a holiday feast. Whatever you call it, I can assure you it is really, really good and amazingly easy to do. Follow directions to a tee, even when they seem counterintuitive, and you'll have no problems. 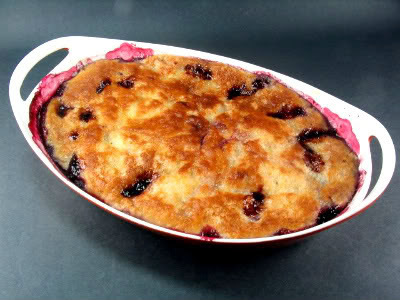 Contrary to popular belief, you may use fresh or frozen fruit to make the cobbler and you are not limited to berries. Any soft fruit may be used. If you don't have this recipe, let me assure you it's a treasure to have on hand when seasonal fruits ripen. If you do have the recipe, consider this a reminder of how very good this cobbler is. Your blackberry cobbler is gorgeous! I'll try it once I found some nice fruits to go with. Absolutely beautiful! Saving your recipe and will be giving it a try very soon. Not heard it called shiny topped but I know it well. Might be just the thing for the neighborhood party tonight. I love blackberries but they are so seasonal here. Looks like a perfect finish to any summer gathering. i could really go for some of this. it reminds me of the way my mom baked when I was a kid. Blackberry cobbler is a favorite -- but we use piecrust as a topping -- so our cobbler (at least here on the prairie) is like a one crust deep dish pie -- but crust (any kind), sweet blackberries and cream or ice cream is a terrific dessert -- and one worthy of ending a special meal. This sounds so good. I haven't been able to get any good fresh berries yet, but when I do this will be something I definitely make. I enjoy coming here and looking at all your wonderful recipes. Beautiful Cobbler! I am just loving cobbler right now! I will have to try your recipe soon! I am trying to get out and pick berries this month! Iris, I'm so glad we have you coming back for more :). I love to have you here. That is scrumptiously beautiful - the deep, shine of the berries - and sweet/tartness sings to me. Love this and will make it now that berry season is here! This cobbler looks heavenly, Mary. Wish I had a big bowl of it right now, with ice cream of course. Berries are just starting to show up at the market so look forward to making this very soon. Claudia, welcome to One Perfect Bite. I hope you'll become a regular visitor. Delicious. Cobblers, buckles, pandowdy- they are all pretty new to me. I did not grow up on those. But I have tried a few and have enver been disappointed. I dont think I would be disappointed with this one either. Looks yummy. This is the perfect cobbler, Mary...I love this type of topping and the juice that forms with baking; it's soooo good! Thanks so much for this Mary. I would imagine that I could even use mango. I am going to clip this recipe, it's just the perfect bite for this time of year! Sue, I'm so glad you'll be joining us regularly. I just saw an ad that said my favorite market has berries on sale this week. This would be a perfect way to use them! Yum! I have been craving cobbler ever since trying Dorie's. You must have a mine of berries! Oh Mary, another gorgeous, simply amazing dessert. I adore cobblers and blackberries are wow! I have to start making everything that I find on your great blog! Love cobbler!!! Something warm and sweet paired with ice cream is always a winner. 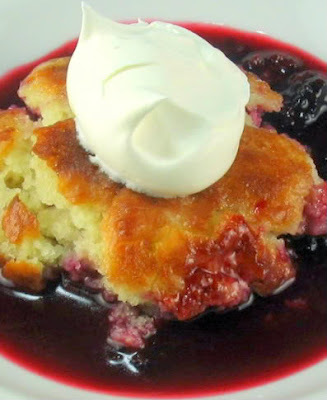 I was just thinking about blackberry cobbler the other day and that is just beautiful! I have never had a blackberry cobbler... but now I think I'm missing something! I could do with a piece of that and some vanilla ice cream for dessert tonight. It looks good! Just found this "nugget" of a recipe. My husband and daughter have been picking fresh blackberries or as we call them Dewberries. I wanted to make them something special with them and WOW was it ever special. I am not a cobbler person at all. Despised them even. But, not wanting to hurt the families feeling and not try their hard work pickings, I ate a piece. OH MY GRAVY!! This is the best recipe I have ever had. The crust wasn't so thin like a cookie that other recipes are. It was light and fluffy and the sugar poured over the top and then boiling water, made the most wonderful crispy/crunchy layer. I have died and went to blackberry cobbler heaven. No kidding, try this recipe!! Looks good. Thank you. But where does the buttermilk go? With the batter? It isn't mentioned. This recipe was amazing! It was super easy and delicious. The only fault is that the serving count of 8 doesn't seem right. We fed about 14 people yesterday and had leftovers. That may be because people ate plenty of lunch before they got dessert. Next time I'm going to try this with cherries!